Organized and developed with today's reader in mind, the Anselm Academic Study Bible is an unsurpassed resource for anyone who wants to know more about the Bible. No previous knowledge of the Bible is assumed here, and newcomers and veterans alike will benefit from the Study Bible's insightful articles, sensible structure, and user-tested design. 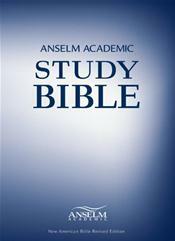 The Anselm Academic Study Bible's unique features include the following: Rigorous scholarship. Academic articles and introductions accompanying the biblical books are based on the latest research. Contributors include both established and emerging Scripture scholars. Rich study aids. Charts, maps, timelines, and reference to online resources enhance learning. Full color and black-and-white photographs of places and objects commonly mentioned in the Bible convey a strong sense of the life and times of the biblical world. Distinctive approach.The Study Bible addresses diverse students, practices sound pedagogy, and encourages critical thinking. Topics include those on cultural, ethnic, social, gender, and political issues and speak to today's reader, explaining the context of the Bible's writing. Navigation-friendly organization. Two academic introductions-Anselm and NABRE-preface each of the biblical books; other resources sensibly and accessibly arranged. Peerless in design, the Anselm Academic Study Bible is appropriate for anyone approaching the Bible from an academic perspective and who wishes to deepen their understanding of this most influential book.